The color gray brings to mind pebbles, stormy skies, and seagull’s wings. Indeed, soothing shades of gray are anything but boring. A patio design from the Paola Lenti Aqua Collection proves gray can be endlessly intriguing with stunning pieces of furniture that create a calming, earthy feel outdoors. 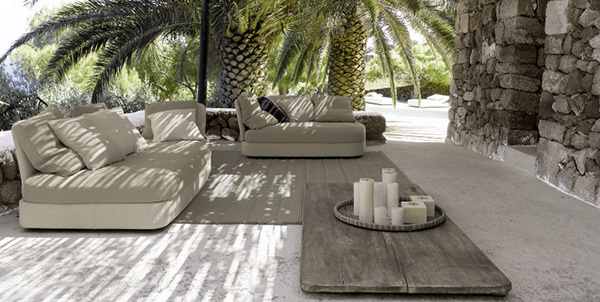 Sofas from the Cove and Frame product lines look welcoming and shady in the midday sun. Soft textile floor coverings in different textures complement the natural aged gray of an old wooden floor, as well as a contemporary concrete floor. The whole theme accentuates the rustic beauty of the rough stone walls; they draw attention as the viewer begins to appreciate the subtle variety of hues and textures of each individual stone. Who would have thought gray could be so fascinating? 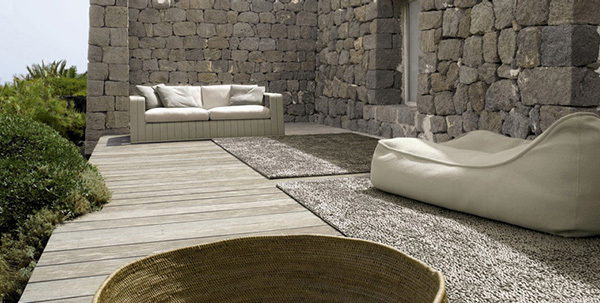 A gorgeous grey patio style that grows better every time you look – with furniture and floor coverings by Paola Lenti.